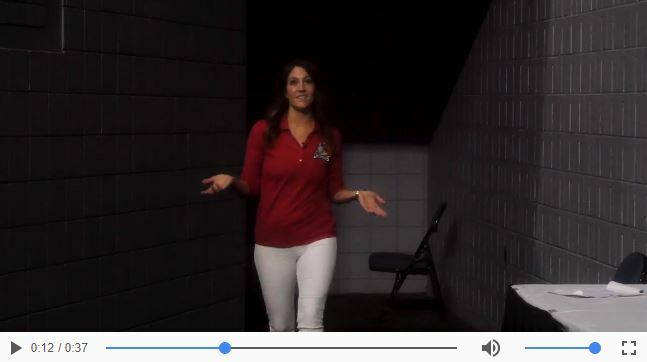 The Grand Rapids Griffins recently took advantage of a one-month trial with OneMob, a personal video communication platform that has allowed them engage and communicate with their clients on a more personal level. After speaking with the Sacramento Kings (NBA) regarding the platform, they learned that the Kings were looking for ways to increase the return rate on the personal emails their account executives were sending to prospects and had had a lot of success with OneMob. Using the platform, the Kings account executives were able to create appealing video email messages that stood out among other emails in their contact’s inbox.The Griffins used the program for a month focusing on FSE Sales and found a lot of success. They used the platform for campaign-style emails to personalize follow-ups with season ticket prospects who were unable to make it to the arena to check out seats. With their account executives finding it to be a valuable sales tool and easy to use, the Griffins plan to continue their use of OneMob throughout the 2017-18 season. 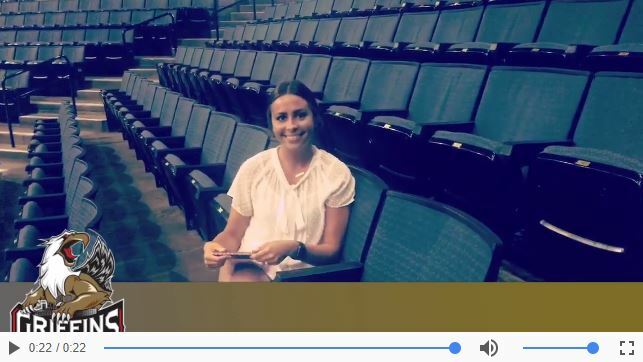 Click the video below to see how one Grand Rapids rep used a personal video message to send to one of her prospects. Griffins reps used OneMob videos when launching their D-ZONE multi-game pack campaign, sending just over 6,500 emails out to 2016-17 D-ZONE 4-Pack, dormant D-ZONE pack buyers and Friday night single game buyers. Click the video below to see the video message that went out to the group. Having used OneMob for a month proved to the Griffins that they need to further use video in their sales efforts. It has allowed their reps to use their smartphones to quickly send quality, Griffins-branded video presentations to their clients and prospects. Having hundreds of single game buyers to contact following a weekend set of home games, reps can now use the program to quickly send a personalized “thank you” and introduction video to their assigned leads opposed to an email with bullets and attachments. The Griffins are able to track the open rates and video views of their emails, allowing them to continually make improvements to their campaigns such as subject lines and content to maximize engagement and sales. Copyright © 2017 American Hockey League, All rights reserved. Hello there! Are you part of the Cisco Ambassador program? Do you love Cisco Spark? Tell us all about your love affair with Spark using video! Your assignment is to record a video about why you love Cisco Spark using OneMob, then share the video in a specified Spark room. Ready? Go! If you have an @cisco.com email address, you will be prompted to enter your CEC credentials. If you do not enter a Cisco email address, click “Login with Cisco Spark” in the next screen. 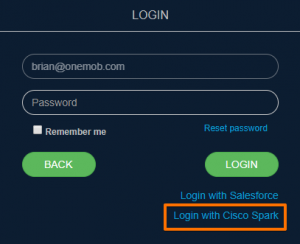 Login using your Cisco Spark credentials. 3. Download the OneMob mobile app to record from your phone, or download the OneScreen Chrome extension to record via webcam. Login to your OneMob mobile app, record a video on why you love Spark, then save it to your OneMob Library. Note: Once the video has been saved to your OneMob Library, please set your phone aside and turn to your computer. Then continue on to step 5. Click on the OneScreen icon in your Chrome toolbar to record your webcam video. Here’s everything you need to know about OneScreen. 6. Head to your Library and find the video you recorded. Click on the “Link” button to its right. Once finished, click “Create Link”. You will be taken to the Link Details page. 8. On the right, click on the Cisco Spark icon. If you did not login using Cisco Spark, you will be taken to the Cisco Spark’s login page. Go ahead and login. 9. 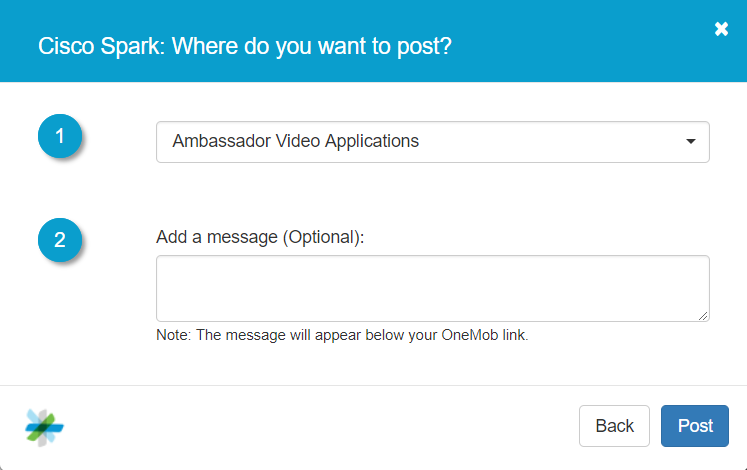 Search “Video Application (OneMob)” (the Spark room from step 1), then click “Post”. Congratulations! You have just successfully shared a video on Cisco Spark! I hope this experience has “Spark-ed” some interest for creating videos! Sarah has high-profile clients in New York, Houston, and London. She would love to meet with them every time they have a question or need services. Her company, however, is one of many that has cut its travel budgets to reduce spending. Now Sarah worries that she won’t be able to meet her clients’ needs. According to Salesforce’s Second Annual State of Sales research report, the second-largest challenge experienced by sales representatives is lack of time for face-to-face selling. But what are the benefits of face-to-face sales? And how can you get more face time with your clients? 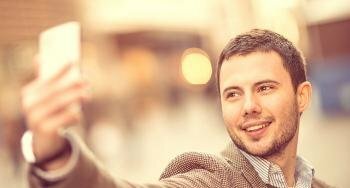 According to the Harvard Business Review, 95 percent of those polled said that face-to-face meetings are crucial to “building and maintaining long-term relationships.” Another 89 percent agreed that face-to-face meetings are essential for “sealing the deal.” The majority of those polled (88 percent) believed that successful sales depend on facetime. The recent economic recession had companies scrambling to cut costs however they could, and travel was one of the biggest expenses to get the axe. Things haven’t changed much. According to the Harvard Business Review, 69 percentof respondents reported a decrease in travel budgets. Most of those polled added that they believed the cuts would negatively impact their sales. Video was and still is the obvious go-to for solving this problem. “If we cannot go directly to the customer, we’ll go directly to the customer’s screen.” You immediately cut out all of the costs of gas, air travel, hotels, etc. Certain video engagement platforms will enable you to communicate face to face with your clients, all for the price of a group lunch. Almost any video conferencing service can solve the problem of cost and distance. But scheduling is a problem whether you meet over video or in person. Especially when your client lives in a completely different time zone than you, it can be maddening to find a time when you are both available, let alone awake. You want to sell, and your client wants to buy. But if buying means jumping through hoops just to accommodate you, your client may be tempted to take their business elsewhere. Asynchronous, short, Snapchat-like videos solve this problem. All it takes is a few minutes for you to record your pitch via video creation/engagement platforms like OneMob and share this with your clients to view at their leisure. Not only that, but clients don’t even need to be in the office to view your video. All they need is a smartphone or tablet, and they can view your video message. And with tracking, certain engagement platforms will let you know exactly when they’ve seen your video, so you can then follow up as you see fit. When you can’t be there in person, your clients still need to see your face. Platforms like OneMob put you in the room with them—on their computer or on their phone, in their office or on the go. This article was originally published at blogs.salesforce.com. Today marks the 3rd birthday of OneMob, and oh what a ride it has been! Over the past three years, I have recorded 900 videos and learned a few things along the way. I found one of my earliest videos from three years ago, and two things immediately struck. Our mission to help professionals interact more effectively is stronger than ever! At OneMob, we love video and we want to make recording, sending and tracking video easy for every professional. So I thought it would be fitting to reminisce on some of the learnings that have occurred over the past three years that have got us here. One of my favorite books is Good to Great by Jim Collins, and I always refer back to the section on “First Who, then What”, which essentially speaks to making sure you have the right folks on the bus. That is critical for us. I am lucky to have a supportive cofounder, Nimesh Gupta, and we always make sure the people we hire not only believe in our vision, but can also be open to moving seats on the bus from time to time. OneMob would not be what it is today without the care and dedication of people like Stefano Acerbetti, Kyle Patel, Nick Ottrando, Hardeep Dhanjal, Stan Kulyavtsev, Simon Nguyen, Sharmila Jesupaul, Carmen Yau, Brian Kim, Deepak Anand, Michael Berber and the many others who have taken a seat on the OneMob bus. Thank you team! Startups are temperamental, but when you have the right folks on the bus and you are all aligned on the direction, you can go as far as you want, assuming you don’t run out of gas. Which leads me to my next point. OneMob is incredibly grateful to have some of the most amazing companies using our platform. Every startup is looking for product-market fit; it’s just want you do. But products and markets change and evolve. We launched OneMob because mobile video was becoming so popular. People were sending “snaps” to one another that later disappeared, all from their new shiny smartphones. YouTube was growing and Instagram was evolving from photos to videos. It was an exciting time! And I remember sitting in Nimesh’s apartment thinking, “we should allow professionals to do the same.” But you can’t just have an idea. You need partners who can take a risk and try what you’re selling, see if it can truly make an impact, and provide candid feedback to ensure you’re driving on the right freeway. I’m so grateful to know that some of our earliest customers from day one are still onboard, and have been essentially co-creating OneMob with us. Without your feedback, OneMob wouldn’t be constantly striving to give you what you need today and what will make you better tomorrow. And we’re not slowing down. Thanks to our amazing team and engaging customers, OneMob will continue to transform the way professionals interact and connect with video. I can’t wait to tell you what happens in the next three years! Ever play a game of telephone? Sometimes the words you say don’t necessarily make it to the other end. But miscommunication doesn’t happen only in games, it happens in almost every aspect of our lives! There’s no better way to present your thoughts than to be able to point and say, “Look here. This is what I’m talking about.” And with OneScreen, you’ll be able to do just that! Create seamless how to videos for complicated digital tasks. Save time by recording your presentation. Don’t write a novel on how a problem can be solved– send your customers a quick 60-second tutorial video. OneScreen is free to download in the Chrome web store. To learn more about our new Chrome extension, check out our support page. Just like a news anchor, you can now read your video scripts on your screen when using our iOS mobile app! This means no memorizing, which means less re-takes, which means more time saved for you! Deliver the perfect presentation or speech without having to memorize a single line! Click here to learn more about Video Scripts on the iOS OneMob app. We’ve changed our pricing plans! Overall, we made everything cheaper, and removed a lot of the limitations we had before. No more limits on number of videos, landing pages, or activities! Company culture is top of mind for most CEOs today. Culture contributes significantly to productivity, as companies with happy employees consistently outperform their competition. It also contributes to lower turnover, which in turn increases profits significantly. Ultimately, a positive company culture drives profitability and growth. 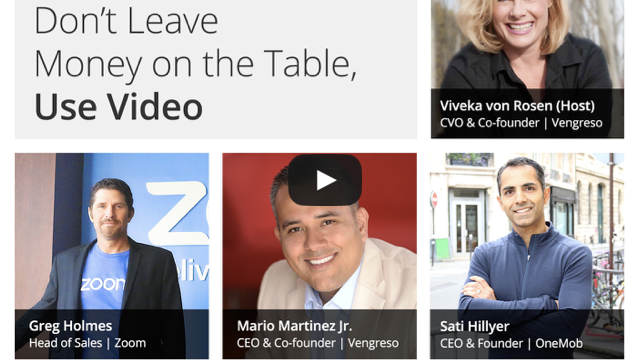 One way to enhance your company culture is through video engagement. As a recent McKinsey study found, CEOs must lead the discussion of transformation, vision, and culture to effectively bring change to their organization. You and your top-level staff cannot physically be everywhere at once, but you can use video to engage meaningfully with employees. 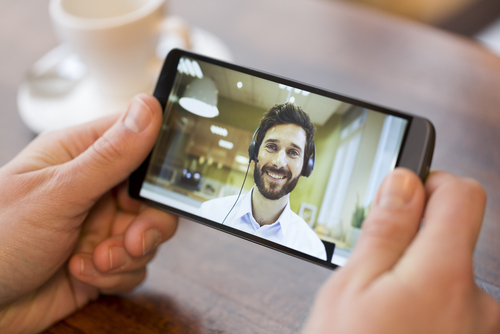 Here are three ways video engagement can enhance your company culture. In 2015, 45 percent of employees in the United States worked from home. With so much of the workforce being remote, it is difficult to develop a cohesive culture with strong corporate values, transparency, and a commitment to employees’ personal growth. Video, however, can bridge the gap and increase cohesiveness. Specifically, personalized videos directly from management can help create cohesiveness in impactful ways. Employees respond best to change management when you, the CEO, are leading the discussion. Videos allow you to interface with your employees directly and to quickly disseminate your vision, news, best practices, and product information. And employees can view your video at their convenience on their time. It doesn’t matter if your company is one office or many; everyone is receiving the same instruction from the same source. According to a 2016 survey, 82 percent of employed Americans feel that their contributions go unnoticed, and 40 percent would work harder if they were being recognized. Expressing appreciation for your employees is a low-cost, high-yield endeavor. According to a 2003 Gallup Poll, recognition improves employee satisfaction and productivity, lowers turnover, and increases customer loyalty. Video is one way to get this done and seen by as many people as possible. The size and spread of your company likely make it impossible to meet with every single employee and thank them one on one, but video allows you to praise in a personal way. You can have all of the benefits of a companywide meeting with none of the costs or hurdles. Remember, your employees have to be reminded that you’re not a robot just as much as your customers and prospects do. They need to know that you and the company at large care for them and value their contributions. The personal touch of a video gets that message across perfectly. When employees feel left out of the loop, company culture suffers. According to a 2014 survey by the American Psychological Association, only about half of all employees in the US believe their employer is open with them, and nearly 1 in 4 employees don’t trust their employer. However, a 2013 Harvard Business Review survey found that 70 percent of employees feel more engaged when management keeps them informed and up to date on strategy. Ideally, you’d like to keep your employees informed and engaged by inviting them to “sit in” on executive meetings, customer meetings, conferences, etc. But that’s not realistic for a variety of reasons such as time, coordination, costs, exposure to confidential information, etc. Through personal videos, however, you can share snippets of these meetings with your employees, providing access to scenarios or instances that they would not otherwise be exposed to. This exposure builds trust and results in employees being more vested in the company’s success. Used correctly, videos can be a medium of cultural change. As organizational psychologist Laura Hamill states, “Culture is not a Ping-Pong table. Culture is not having margaritas on Friday. That’s just surface level. What matters a lot more is what happens when people go back to their desk, when they have a meeting with their manager and interact with the leaders of the company. It’s day-to-day interactions, how people feel they are treated, and how they’re valued.” Video can help your employees feel valued, supported, and connected. Please try to connect with your employees more effectively and work together to enhance your company’s culture. Start by sending them a quick and engaging video. Originally posted on the Salesforce blog. First and foremost, we have added the capability to track how long someone has watched a video. The ability to track video watch time was definitely one of the most highly-requested feature. And today, we’re proud to announce it’s finally available! This will give you a better understanding of your viewer’s behavior. Instead of simply knowing your video page was viewed, now you can better gauge your audience’s interest: Did they watch the entire video, or did they stop after a few seconds? Did anyone watch your video more than once? “Video Watched” will now appear as part of your Activity Feed, in the Activity Detail page. Video watch time tracking is available for OneMob videos only (we currently do not track video watch time of YouTube videos). Ever wonder which video, URL, or document drove the most engagement? Another new addition to the Activity Detail page is the Overview section. The Overview section will provide a graphical representation of total watch time of OneMob videos, and the total instances of your videos watched and contents clicked. The total watch time will help you find out which of your videos are found to be the most captivating, while the total watches and clicks will help you find out which of your contents are in demand. The “Overview” section will now be available in the Activity Detail page. Click on any of the items listed under “OneMob Video Watch Time” and “Watches & Clicks” for preview. Now tracking your LinkedIn and Twitter icon on landing pages. The activity event “Button Clicked” will now be counted as “Content Clicked”, and will only be differentiated by the URL. The default text for email subject and body has been altered.